GDB Landscaping: Your Winter Sanding Experts - GDB Landscaping Ltd. If you’ve read our previous pieces on snow removal and preparing for winter, you’re probably wondering how you can best handle the challenges that come with operating a business during the winter months. Snow, ice, and increased traffic headed into retail centres leading up to the holiday season can cause headaches if left unattended. Solutions like snow plowing and parking lot sanding can make a huge difference when it comes to safety and accessibility. Sanding helps provide traction on icy walkways and parking lots. With the proper equipment, a dedicated schedule, and partnership with a reliable winter service provider, you’ll have the luxury of focusing on running your business opposed to handling disgruntled customers that are struggling to find parking, or worse: possible injury claims. GDB Landscaping provides 24-hour sanding services for commercial businesses all throughout the winter. Our fleet of vehicles is equipped to handle large and small-scale jobs, and ensure your clients can access your property with ease. 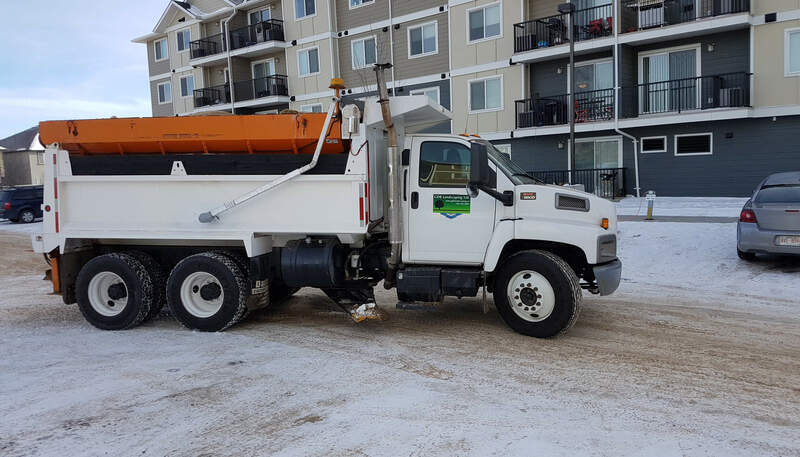 With over 45 years of combined experience in commercial landscaping and snow clearing services, we’re proud to offer flexible solutions to owners, developers, and mangers of large, multi-family/unit centres. Contact us today to learn how we can help you with all your winter needs! View our snow removal / plowing page for more services that we offer.